Apply For:Bedroom / Living Room / Dinning Room. Mat Size: 1'4"x4'(40x120cm). Selection of high-quality anti-slip materials, combined with advanced printing technology, clear and bright color, water does not fade. This beautiful and unique area rug is hand woven hand braided by skilled artisans. Crafted from Eco-friendly 100% Natural Multi-colored recycled fabrics fully reversible for extended usage. Indoor Use Only. Size: about 4.9'x4.8'（150x146cm）. 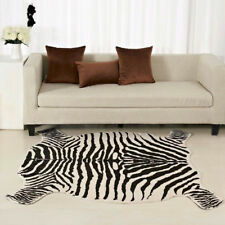 Multi-use rug for: sofa, car seat, chair, floor, bed, souvenir etc. Surface Materials: - 100% polyester,Backing material - polyester suede fabrics.very soft feeling, Luxurious look and comfortable. Surface:Polyester Fibre. Weight:about 1300G. Pile Height:about 2MM. 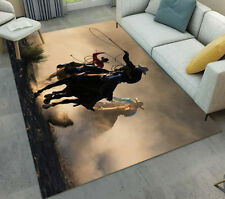 Multi-use rug for: sofa, car seat, chair, floor, bed, souvenir etc. Dry out/do not expose to sunlight. Base material: suede. surface material: 100% polyester. In this way, you will know the process of your parcel. Item :- 1 Pc Jute. Beautiful traditional Jute and Cotton Rug/Carpet. Carpet Rug. Design :- Oval Rug. Floor Rug. This rug is very Eco-friendly with a very low carbon foot print. Braided on traditional hand looms from India. Surface:Polyester Fibre. Super Soft. -Easy clean, just spray with water or sweep. It is easy to washed by hand.hand wash or dry clean only, no machine wash. Fake Beard. Easy clean, just spray with water or sweep. Beautiful traditional Jute and Cotton Rug/Carpet. Carpet Rug. Design :- Round Rug. Floor Rug. Item :- 1 Pc Jute/Cotton Rug. This rug is very Eco-friendly with a very low carbon foot print. Room Decor. Surface:Acrylic Fibre. Weight:about 450G. Pile Height:about 15MM. Item :- 1 Pc Jute. Beautiful traditional Jute and Cotton Rug/Carpet. Room Decor. Floor Rug. Upholstery Fabric. Each piece is unique and made by hand on a loom, using threads of knitted or woven cotton. Surface:Polyester Fibre. Easy clean, just spray with water or sweep. It is easy to washed by hand.hand wash or dry clean only, no machine wash. Avoid direct sunlight. Weight:about 550G. Fake Beard. This beautiful and unique area rug is hand woven hand braided. Crafted from Eco-friendly 100% Natural Multi-colored recycled fabrics fully reversible for extended usage. Indoor Use Only. Spot clean only. Surface:Polyester Fibre. Weight:about 900G. Pile Height:about 8MM. 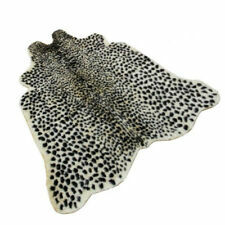 Leopard Animal Printed 3.4'X3'1 Zebra CowHide Faux Fur Rug Mat Carpet Blanket. Surface:Acrylic Fibre. Weight:about 450G. DO NOT DUPLICATE OR COPY! Surface:Polyester Fibre. Weight:about 1100G. Pile Height:about 2MM. MATERIAL :- Jute. Beautiful traditional Jute and Cotton Rug/Carpet. This mat is made from recycled fabric and jute, hand braided and then stitched together in circle as. This rug is very Eco-friendly with a very low carbon foot print. Item :- 1 Pc Jute Rug. Beautiful traditional Jute and Cotton Rug/Carpet, Braided on traditional hand looms from India. It is reversible and can be used from both sides. Design :- Rectangle Rug. Beautiful traditional Jute and Cotton Rug/Carpet. This mat is made from recycled fabric and jute, hand braided and then stitched together in circle as. 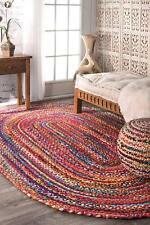 Colorful braided round rag rug. 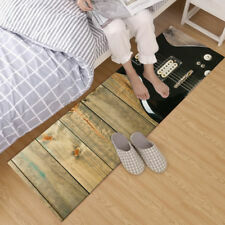 This rug is very Eco-friendly with a very low carbon foot print.